Thank you so much to Destiny over at Rockin' Mama for nominating me! 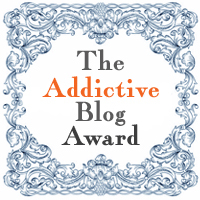 Copy and past the award onto your blog. Well golly I already talked about why I started blogging a few days ago, you can check it out here. (wow, I feel super lame for only nominating one blogger but I don't know any other bloggers that would actually participate in this besides this little lady).